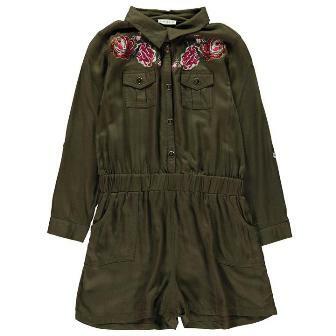 This Crafted Jumpsuit is a stylish little number for your little lady to wear. Its khaki lightweight construction is styled with long sleeves, a fold over collar and a button fastening to the front for a easy wear. The front of the jumpsuit is crafted with two open hand pockets, two chest pockets and embroidered roses to make this jumpsuit a look that is bang on trend!